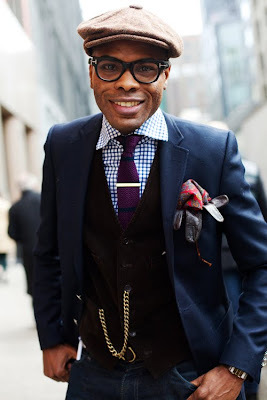 i'm obsessed with the sartorialist blog. the man behind it is a fashion photographer and goes around snapping shots of people with interesting fashion sense or styles he admires on the streets he's located. sometimes they are more of the famous type, and sometimes just your regular gal or guy. i dream of one day being able to be on his blog. here's a shot of a man he ran into on the busy streets of NYC.